Use the Quick Quote button or click the product image above to open your email program and request a quote for the options you are looking for! '2,200 lb. tension strength, military spec, steel aircraft cables with swiveling ends provide durability and low maintenance. 'Impact resistant fiberglass reinforced nylon with precision machined steel ball bearings. above to open your email program and request a quote for the system options you are looking for! Use the Quick Quote button or click the product image above to open your email program and request a quote for the system options you are looking for! 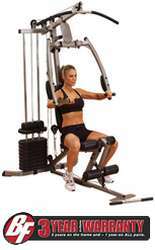 'Fixed pulleys also swivel to adjust for a variety of different exercises with smooth, consistent resistance. 'Two-way adjustable back pad and adjustable seat pad ensure a proper starting position for all users. 'Design-forward aesthetic features graceful arcs and brushed steel finish that looks great in any home. 'New curved, design forward aesthetic. '50mm x 100mm 11 ga oval tubing. '4 position Biangular Press arm with ergonomically designed multi-position handles. 'Seated leg extension / leg curl with pivoting rollers. Chest supported mid row arms. 'Synchronized articulating functional training arms with range extending from upper ab exercises to side accessed workouts. 'Lat pull down with wide groove pulleys. Telescoping backrest with multiple position cushion. 'Two Pre cabled accessory attachment points. High-density foam handle grips and chrome endcaps. 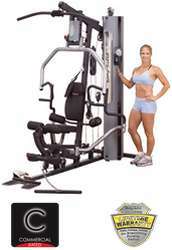 (FCDWA) FUSION Weight-Assisted Dip & Pull-Up Station For use with the FUSION 500 or FUSION 600 Personal Trainer Gyms. 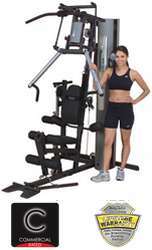 (FKR) FUSION Vertical Knee Raise Dip Station ' � for use with the FUSION 500 or FUSION 600 Personal Trainers. 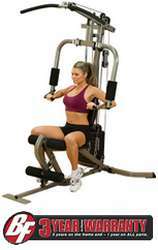 (FLP) FUSION Leg Press Attachment - For use with the FUSION 500 or FUSION 600 Personal Trainer Gyms. 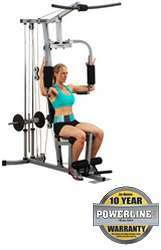 'Traditional press bar is biomechanically designed for maximum chest concentration and outstanding muscle development. DuraFirm pads with lumbar support provide ultimate comfort and prevent lower back strain. '2,200 lb. tension strength, military spec, steel aircraft cables with nylon sheath provide durability and low maintenance.
' pulleys are impact resistant fiberglass reinforced nylon with precision machined steel ball bearings for prolonged cable life, smooth movement and maximum durability. 'Patented Bi-AngularÂ® converging press station replicates free weight dumbbell presses and provides 25% more muscle interaction. '160 lb. (73kg) selectorized weight stack. Optional 210 lb. (95kg) weight stack available. 'Easy to use, space saving, no-cable-change design. Leg developer station features the SmoothGlide Bearing System with biomechanically accurate pivot point. 'High-density, top grade DuraFirm pads with lumbar support provide ultimate comfort and prevent lower back strain. 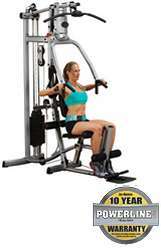 'Flip-up seated row foot brace plate stabilizes your body when using heavy resistance. pulleys are impact resistant fiberglass reinforced nylon with precision machined steel ball bearings for prolonged cable life, smooth movement and maximum durability. '12-gauge mainframe construction assures maximum strength, function and durability. 'Telescoping, chrome plated, adjustable seat post for quick, smooth adjustment and proper body positioning. Best Buy Consumer's Guide Budget Buy! 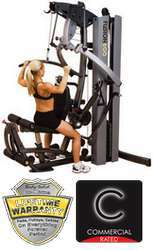 The G5S Home Gym from Body-Solid has a wide array of special features that make this a great Budget Buy. It could have been just as easily ranked as a Best Buy, but for its most competitive price point. Consider this: The Pec fly station has pivoting handles, there's a bearing pivot point for press bar for smoother motion, and for certain comfort, the G5S has a gas-assisted seat adjustment. 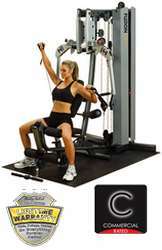 For working out on the low pulley station, just flip the footplate, and for constant monitoring of your conditioning, the G5S provides ergonomic grips (thicker for pressing, thinner for pulling) that are also angled to provide perfect wrist alignment for bench presses, incline presses, shoulder presses, and mid-rows. The G5S features a self-aligning cuff for the leg developer, and the 210-pound stack can be upgraded to 260 pounds. Plus the G5S allows offers a Customized Aluminum pulley upgrade for keeping fit. Also included with all Body-Solid home gyms is a free workout DVD to help you get started right away. 'Patented Bi-Angular converging press station replicates a free weight dumbbell press and produces 25% more muscle interaction. 'Self-aligning, contoured leg extension cuffs automatically adjust throughout the exercise movement. High-density, top grade DuraFirm pads with lumbar support provide ultimate comfort and prevent lower back strain. 'Telescoping, chrome plated, gas-assist adjustable seat post for quick, smooth adjustment and proper body positioning. pulleys are impact resistant fiberglass reinforced nylon with precision machined steel ball bearings. 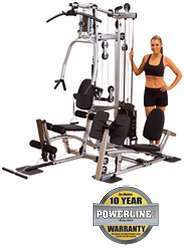 '11-gauge mainframe construction assures maximum strength, function and durability. 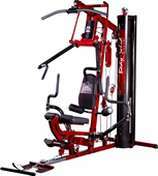 Arizona Extreme Fitness will deliver and setup your favorite quality name brand Bodysolid home multi-gym in Prescott, Flagstaff, Sedona and Phoenix, Arizona at your location! Come on in and browse our 3000 sq ft warehouse showroom in Prescott Valley, Arizona and try before you buy or if you already know what you want just call us for our best price and we will deliver or ship it to you depending on your location in the USA. 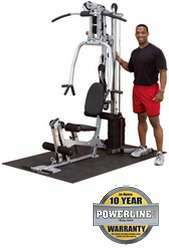 We sell, deliver, setup, install and service the above quality brand Bodysolid home multi-gyms.